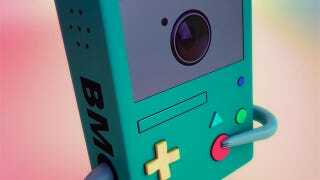 Beemo, the true star of TV series Adventure Time, isn't just an adorable little portable gaming system with more than a passing resemblance to Nintendo's Game Boy. He/she/it is also an alarm clock, music player, video projector and, in this awesome 3D image, a camera. If you thought at first this was an action figure, you're not alone. I was halfway to my credit card before I realised it was "just" an image.